Former European Le Mans Series LMGTE Champion Alex MacDowall sustained a harsh blow to his 2018 title ambitions at the Red Bull Ring in Austria on Sunday, 22nd July, when gearbox problems during round three of the season resulted in a very frustrating retirement. Everything had gone very smoothly indeed for the JMW Motorsport Ferrari F488 GTE up to that point, with Spain’s Miguel Molina securing the squad’s first pole position of the season during qualifying on Saturday, 21st July, and the early part of the four-hour race also went largely to plan. Soon after Carlisle racer MacDowall had climbed aboard the No.66 car during the second hour, though, their challenge – quite literally – ground to a halt when gearbox problems led to the Ferrari being stuck in third gear. Despite eventually being towed back to the pits, nothing could be done and so an early shower awaited the Briton and his team-mates. 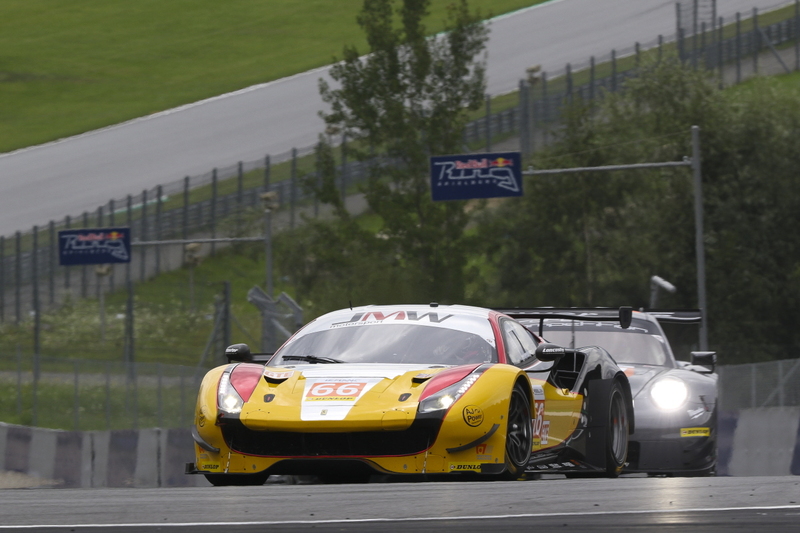 MacDowall, Molina and third driver Liam Griffin had gone into the third race of the season with a six point lead at the top of the LMGTE Championship but, after the enforced retirement, they departed Austria sixth in the standings. “It just wouldn’t shift the gears”, reflected 27-year-old MacDowall, “It got stuck in third, I tried to get the car back to the pits but totally lost drive and there was no momentum. I got stuck at a pretty dangerous part of the track really. Comfortably setting the pace in the opening free practice session on Friday, 20th July, in free practice two on Saturday, 21st July, the JMW entry was fourth quickest in LMGTE to conclude its strong preparation ahead of qualifying. Spaniard Molina took qualifying duties in the No.66 Ferrari F488 GTE and starred with a fantastic performance to secure the team’s first pole position of the European Le Mans Series campaign, a time of 1m28.827 seconds (175.0 km/h). The team’s ‘Bronze’ graded driver Griffin took the opening stint of Sunday’s four-hour contest and although edged back to third place, a great battle ensued with the similar Spirit of Race entered Ferrari and he ended the opening hour third in LMGTE. All looked comfortable with a podium bid, at the very least, there for the taking but the gearbox issue put paid to those hopes and gifted the JMW squad’s rivals a heavy advantage in the driver standings as the first half of the season concludes. Next on the European Le Mans Series calendar is the home race for MacDowall, round four of the season at Silverstone Grand Prix Circuit on Saturday, 18th August.